They still advertise like this…? Every now and then, my assumption that western civilisation evolves at a more or less even tempo receives a jarring wake-up call. Today is one of those occasions. Somewhere in Ohio, apparently, it is still 1978. How the years slip away and Benny Hill’s face moves into crisper focus, as I watch someone called Joe Jordan and R&R Bait & Tackle combine their promotional efforts around a single theme. And fishing. Joe at least, might just have got away with his part of the deal, so willing was I to extend him the benefit of the doubt and assume that the bikini’d young woman who opens the clip is his wife or girlfriend. On reflection, he may feel that the part where he has to check what her name is should never have survived the first edit. This, however, pales alongside the advertising intermission at the 33-second mark. It’s not the body of Bikini Woman number 2, holding up an ‘Open Seven Days a Week Sign’ in the floats aisle, that lingers in the memory, so much as the body language. This is either a model, slowly coming to terns with the fact that she’s drawn the day’s short straw down at the agency, or else a long-suffering staff member mentally calculating before our eyes what ‘taking one for the team’ will cost her employer in bonuses and free bait. We return to Joe and his associate, reeling in bass and pike in northern Michigan, before popping back to R&R at the 4:47 point, where a young woman in hot pants (probably the accountant) wants to tell us that you can’t go wrong with Weld-craft fishing boats. Lest there be any doubt on that score, the camera cuts to a photo of the said vessel, with another woman in a bikini draped across its back end, clearly savouring every second aboard “the most reliable, durable boat on the planet”. All told, this peek into Joe and R&R’s parallel universe runs to almost 12 minutes, and even as you hope that there might yet be some ironic, self-aware punchline that makes everything all right, the clip blindsides you once more, closing with a quote from St Paul’s letter to the Philippians – I can do everything through Christ who gives me strength. Whether it’s Joe or the proprietors of R&R Bait and Tackle whose strength needs occasional replenishment isn’t entirely clear. There’s nothing informs quite like the Internet but it has no sensitivity filter. One minute you’re scrolling quietly through Twitter feeds – the ‘rods for sale’, ‘caught this yesterday’ and ‘my mate’s stupid hat’ mundanity of it; the next you’re sitting bolt upright in your chair. I think I met Mike Roden twice, both times at the charming Curley’s Fly Fishery, one of those rare in-town waters where flyline routinely soars against the backdrop of a passing bus and where, on a clear day, you can turn away from the reservoir on the dam wall and see the Irish Sea glinting beyond Southport in the distance. If it’s not the only fishery in the land with a baby grand piano in the lodge, I’ll be astonished. Mike was in charge of tuition at Curley’s the first time we met, and running the venue’s fishing operation the second. We shot some instructional video with him on the latter visit and were so impressed at the confident ease with which he imparted information in front of camera, we christened him ‘One-take Roden’ in the car going home. Friendly and helpful, some people you only need meet twice to warm to them. Thank you and God bless you, Mike, and my condolences to those you loved. 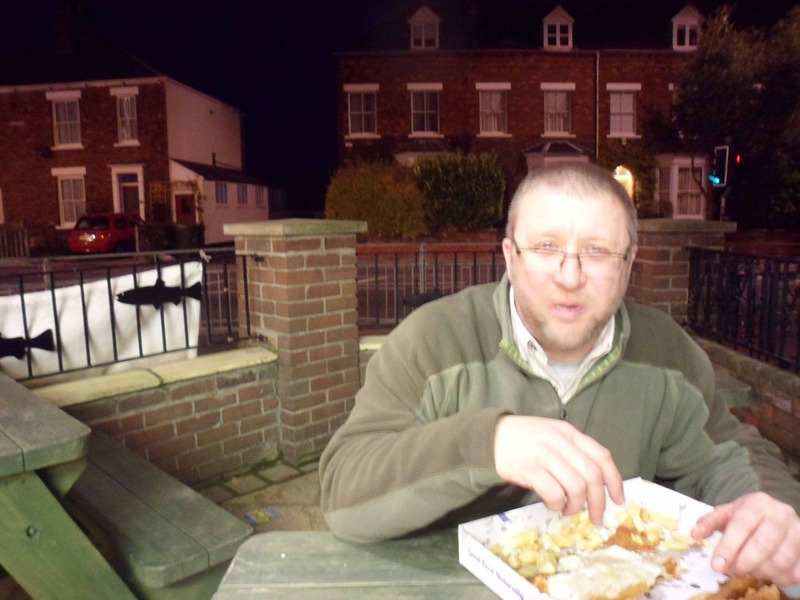 After a hard day’s fishing with an upcoming issue of the mag in mind, Trout Fisherman stalwart Nick Halstead and your equally-ravenous correspondent called in at a chip shop in Beverley, East Yorkshire, for as good a fish supper as you could wish for. Excuse the camera-shake (tear me away from my food and I’m never at my best) but pictured is the very-beautiful Mr Halstead himself, tucking in. Be assured, there is no posturing machismo involved here: the temperature was just a few degrees shy of ‘balmy’. We are beyond ‘global warming’ and ‘climate change’ now. We are well and truly in the realms of ‘funny weather’. Seriously, if a guy who looked like he does came out of nowhere and offered to help you with your fishing, I doubt you’d know whether to run or hand him some kind of helpline number. Such is the danger of being swayed by image before you’ve assessed the substance behind it. The hirsute McFadden is in fact a fishing guide of such repute on Alaska’s Kenai River that he has just been voted into America’s Fresh Water Fishing Hall of Fame. Jim Hardy will no doubt have been remembered for many remarkable things since his death at 85, earlier this month. The one I will remember him for is that his epitaph was up and running a full four years before he died. If you haven’t seen The Lost World of Mr Hardy yet, I urge you to do so. Nothing like the corporate puffery I expected, it is rather a moving tribute to an era lost forever, played out against a musical score that tugs at every nostalgic fibre in your body. In a modern era bloated with self-aggrandisement, there are many who witter on about their ‘legacy’, far fewer who genuinely leave one. Jim Hardy – the moustachioed gentleman last seen poignantly disappearing round a corner in the following clip – takes his place firmly in the latter category.